The leather business in Divej Mehta&apos;s family is 50 years old. Started by his grandfather, the company has grown multiple folds over the years and continues to export premium quality leather across Asia to top footwear brands. When Divej had to take the family legacy forward, he didn&apos;t want to stop at merely expanding the company; he wished to bring something new. He wanted to create a perception that a leather business could be more than just killing animals. He came up with the idea of working with inmates inside state prisons. He didn&apos;t perceive them as mere convicts but as a potential workforce. He started getting in touch with people who could connect him to prison authorities. 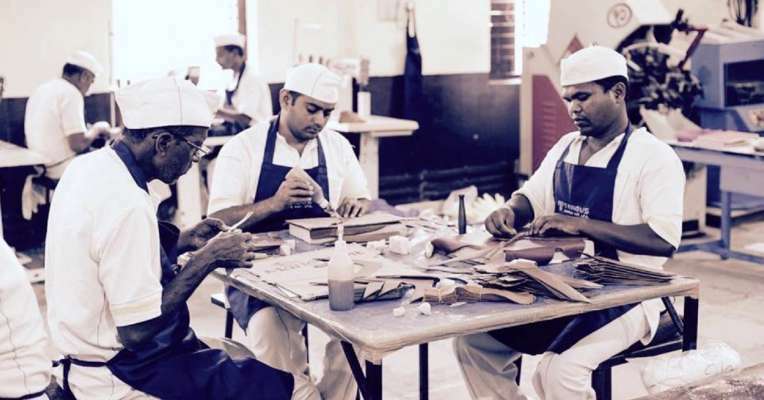 The initial idea was to start the first premium leather footwear unit inside the state-run jails in Tamil Nadu since his company&apos;s four manufacturing units operated from the state. But for inevitable reasons, the proposal couldn&apos;t formalise. But Divej was undeterred in his resolve to make the idea work. Born and brought up in Mumbai, the man decided to approach the Maharashtra state government prison authorities in a bid to start a manufacturing unit in the Yerwada prison in Pune, which is also the state&apos;s largest prison with a capacity of 5000 inmates. Speaking to The Better India, Divej says, "When the idea came to me initially, it was a superb business model-there was cheap labour, free land by the state to set up a unit and the concept came under Corporate Social Responsibility. It was only when I visited the Yerwada prison, did I realise how this idea could work wonders in the lives of these inmates who have been aloof from the world for years. When I met them, their living conditions as well their states of mind, rattled me. This was my opportunity to look at &apos;Inmate&apos; beyond business or profit-making. It was about true rehabilitation." But their path was filled with obstacles. Divej sheds lights on these challenges saying, "The first step was not to train them on a product or skill but to prepare them mentally to become workers, which took us over eight months. Breaking the ice was difficult. They had regressed to a shell and refused to trust anybody from the outside. The experiences they had lived through were difficult to forget." "We have trainers who conduct skill-training workshops for the inmates to maintain the quality aspect. Anybody in the market can make a normal product, but we wanted the inmates to be trained so that they stand out, and the opportunities for them to land jobs in the shoemaking business post their release are higher," shares Divej. He recalls the story of one of the inmates who was perhaps the first one to interact with him when he visited the prison to talk to the inmates about the idea. Due to his people-management skills, this inmate has now been given the position of the manager at the units that operate inside the prison. He wasn&apos;t skilled at the machine but was excellent at managing the inmates and keeping the production going. "I still remember the day he walked up to me and spoke in perfect English. He was looking forward to getting the best out of the project. An engineer who worked with a reputed company, a good package and a great family, he got convicted in a case where his life flipped overnight. His wife was in the seventh month of her pregnancy when he was convicted. Working hard at the manufacturing unit, he saved every bit of the money he received and started sending it to his family. "After receiving the money, his wife barged in and asked him angrily, &apos;What have you done now? How are you earning money in prison?&apos; When he told her the source of his income, she was moved. He spent seven years in confinement, without having met his son, who was born a few months after he was convicted. He finally met his son and held him in his arms when his wife decided to bring him along to the prison," says Divej. This man&apos;s story inspired many other convicts to start sending money home. Even those who hadn&apos;t connected to their families in 10-15 years, were able to reunite. "It was quite emotional. The inmates walked up to me and told me how they could finally see a ray of hope for their future. How this could be their chance at redemption and a normal family and work life post their release. This motivated me to launch Inmate as a brand and spread the word, where people could support true rehabilitation by buying a pair of footwear," shares Divej. "I remember speaking to the authorities saying even an amount of Rs 61 was not going to cut it for anybody. It is too cheap to be real. And so together we decided to create a welfare fund not just for the workers but all inmates inside the prison. The balance amount after deducting Rs 61 goes to this fund, which aims to improve the quality of food, clothes, and other facilities that can be provided to inmates within the prison premises," says Divej. "Even if I get 50% of this population to start working and set up units outside where they can work post-release, be given accommodation, food, shelter, or whatever it is that can help turn their lives around, the purpose of this project will reach its culmination," adds Mehta. While Divej&apos;s team will take some time to set up units outside the prison, he has helped two inmates who completed their sentences get jobs through his company&apos;s network. The starting range for footwear by Inmate is Rs 2,500. If you visit their website, you&apos;d see about 1,200 pairs available for sale. Tergus continues to handle the marketing and social media promotions for the brand. "As much as we want to help the inmates turn their lives around, we cannot forget that many of them were convicted for crimes that perhaps ruined someone&apos;s life and family. We want to complete this loop of rehabilitation that we have started. I am looking forward to raising funds for the victims and their families. These will be raised by a separate company under Tergus to provide food, shelter, education or even monthly ration for these families. I am in talks with the government to set up a special team, including retired cops which will create a database and trace these families to help them. We want to make this a reality," says Divej, as he signs off.